SEO competitor analysis is the act of research, monitoring and analyzing the websites of your competitors. 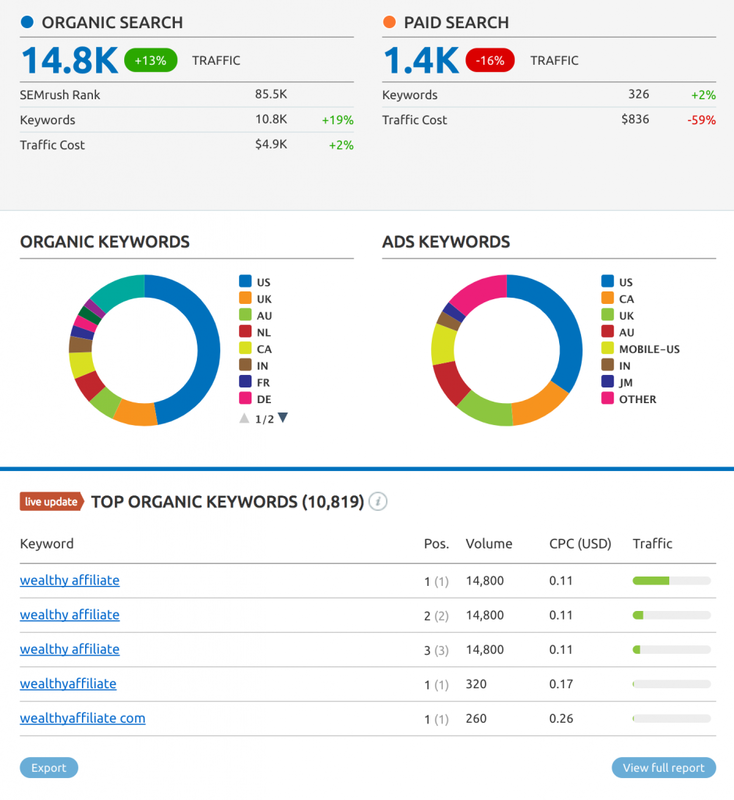 The analysis determines the main keywords in which your competitors are competing. It also lets you see how their website is performing in terms of traffic (both paid and organic traffic). This point may seem straight forward, but from my experience I’ve realized that one thing many people get confused about is that your business rivals may not necessarily be your SEO competitors. The converse is also true. Your SEO competitors are not always your main business rivals. This step in the SEO competitor analysis is very important. You want to first determine for which keywords you want to compete. You can use any keyword research tool. I recommend using Jaaxy. If you’re now starting off with your website then it is critical to target keywords with low competition. Do not try to compete with the ‘big boys’ for top ranking keywords. You’d be starting a battle you can’t win. Imagine competing against CNN, Forbes, Huffington Post or Men’s Health. Instead, start off broad then keep narrowing down your keyword by making it longer. For example, if you would not want to compete in for the keyword ‘guitar’. That’s too broad. The quote search results (QSR) return a result of 184,620 searches per month with 336 websites competing directly for that term. Too much competition. You want your QSR to be below 200. Below 100 would be best. You’d want to refine your keyword some more. 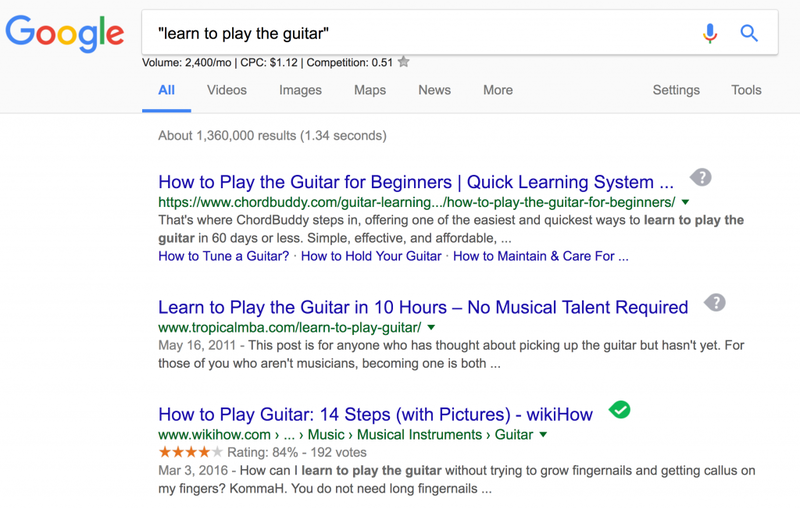 For instance, you could go with ‘how to play the electric guitar’ that’s a very targeted long tail keyword. The competition is only 86 other websites competing for the exact keyword. That’s more doable and the search results is still decent enough. Once you’ve identified your long tail keyword, you’d want to then determine the potential competitors for that keyword. Go to Google. Enter your long tail keyword. Make sure to use the quotation marks like this example, “how to play the electric guitar”. Google will then display the top ranking websites for this keyword. Remember to ignore any sponsored search results. 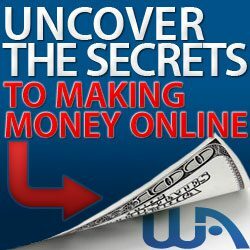 Only target the organic results (the results that are not paid ads). You may wish to target the top three to five websites for this keyword. These are your top SEO competitors. Your next step after identifying your competitors is to perform some analytics. I’ve been using a particular tool to analyze my competitors. I simply add the website URL of my competitor and it spits out a report that shows a number of key data. I also run a report for my own website. This is important as you want to compare your website with your competitors on every point to determine what to improve. A so much more neat info. Why is Competitor Analysis Important? There are a number of reasons you’d want to perform SEO competitor analysis. You need to learn from your competitors. Gain as close as possible to an insider glimpse into your competitors’ SEO and keyword strategies and techniques. See what they are doing. Copy it and try to do it better. For instance you may see which keywords are performing best for them. That might give you ideas of which keywords to pursue. Go to the relevant post or page for that keyword and see what you can do better. Maybe they don’t have video. You could then write a really awesome post on the keyword and insert an amazing video (preferably your own). See what gaps exist. By carrying out competitor analysis you may be able to see gaps that you can take advantage of. The example above of content gaps is one instance. But you could also find gaps in terms of which backlinks they are missing out on. Or perhaps you could discover certain keywords that they are not using at all. You may even be able to discover which segment or segments your competitors are not even targeting. For instance, using the electric guitar example, you may notice that your competitor is not targeting women. Then, you could capitalize of this untapped niche. (on Facebook there are between 6 to 7 million active monthly users who are women above age 18 who are interested in the electronic guitar). That could be a potentially great niche that your competitors are not using. Competitor analysis is also important because you want to be constantly ahead of the game. But you can’t be ahead if you don’t even know where your competitor’s business is in relation to yours. I have often struggled with performing competitor analysis when targeting keywords so this is definitely something that came at the right time for me! Great Kevin. Glad that the SEO tool was useful for you. I believe the information of Competitor Analysis will be invaluable for building your business in it relevant niche. It is one way to find the keywords we will use for our articles and the like, but as you’ve pointed out, know what your competitors are doing with those keywords and optimisation can really help you play in the same ranks as them. Your welcome Marius. 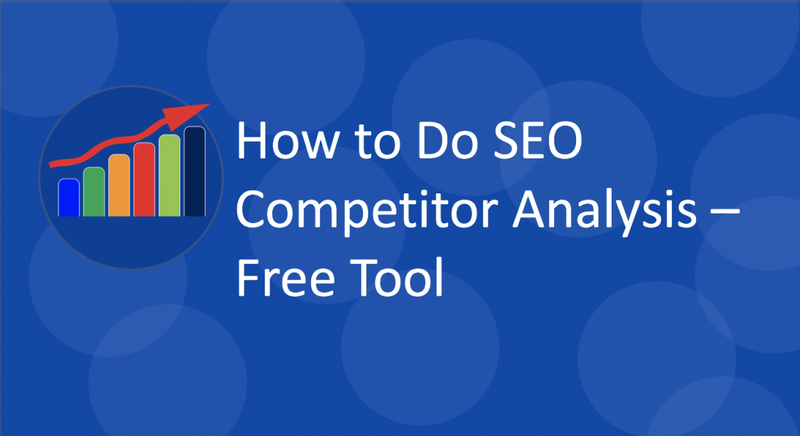 The SEO analysis tool is free to access. Hi Kevon, great post. This is the first time that I have heard of SEO Competitor Analysis. I have always rely on the results that I get back from Jaaxy without doing any further investigations into what my competitors are doing. I have learned a very valuable lesson after reading your article. From now on I will do the method you teach here as another layer to go together with the result that I get back from Jaaxy. By doing that, I think I will have a better Idea where my SEO stand compared to that of my competitors. Your welcome Pelesio. I am glad that you found this article on SEO competitor analysis beneficial for your online business. Let me know if you need any further assistance if you ever get stuck. Try out the SEO report. Thanks for the information about Competitor Analysis- I think it is very important skills to learn. Will try to do it. I’m glad you approve Olina. Check in with me if you ever need some guidance on how to implement your SEO competitor analysis. Hi, Kevon. I have not reach that stage but I convince that it is important for the future progress. I saved this post for the next guidances. Thank you very much for the tips. You’re welcome Melani. It is never too early to check out the competition. Are you posting content to your website already? If so, then you can start monitoring your competitors’ keywords. This is a critical aspect of your content creation strategy. See what articles the competition are doing and do it better. Add a lower competitive keyword, add more images, add a video even. So it is NOT too early to start. Thank you for such an interesting article. You lifted the veil from my eyes with it. All that ‘SEO thingy’ can sometimes be a tad overwhelming but you sure cleared some clouds for me. Your points are all very solid one and I am happy you shared them. I will surely analyze my site and keywords and see how I can improve. Thanks Michelle. I am glad I was able to assist. Did you try the SEO competitor analysis report tool? OK great. No problem Michelle.